“Here lies the fleetest runner the American turf has ever known, and one of the gamest and most generous of horses” so says the inscription on the tombstone of the legendary thoroughbred Domino. Although he lived for only six years, Domino left an indelible mark in history as a race horse, and one of the most remarkable legacies as a stallion the turf world has ever witnessed. Domino was bred in 1891 at Dixiana Farm in Kentucky then owned by Major Barak Thomas. Domino was by Himyar – Mannie Gray by Enquirer. His sire Himyar was a top flight source of speed while his dam Mannie Gray, a solid stakes winning mare known to possess a quick turn of foot, had already produced five stakes winners before she foaled her most famous son. Domino had three crosses of the great Lexington (3x4x4) in his pedigree and a further cross of Lexington’s sire Boston in his fifth generation. Domino had pedigree. Back when Domino was bred, stamina was the key ingredient breeders looked to enhance when they selected stallions to breed to their broodmares. By breeding Mannie Gray to Himyar, Major Thomas was bucking the trend and in so doing he bred a colt that would change the face of racing. Thomas sold the colt to Foxhall Keene, son of the legendary James R. Keene for $3,000. This was the sales topping price at the Tattersalls sale in New York. The average for the sales of that year was $895. The elder Keene was not as taken with the colt as was his son. Both father and son merged their racing stables together to form a singular outfit that would dominate the racing circuit during the gay nineties and into the next century. Domino raced under the white with blue polka dots colours of James R. Keene, and did so spectacularly, earning the nickname “The Black Whirlwind”. Domino dominated the two year old division winning all nine races he entered. His first race came on May 22, 1893 in a five furlong dash. Domino won the race by six easy lengths and then was sent out five days later to capture the Great American Stakes at the same distance. Both races took place at the old Gravesend track. Two weeks later he made it three for three with his wire to wire win in the Great Eclipse Stakes at Morris Park. The Black Whirlwind was off and running. Another highly regarded two year that year was a colt named Dobbins. Domino defeated Dobbins in both stakes races. Domino then met the first true test to his class in the Great Trial Stakes at Sheepshead Bay. On a track listed as heavy and conceding seven pounds to his rivals, the Keene colour bearer won by a slim neck from Hyder Abad and Dobbins in hot pursuit. Two more stakes wins, the Hyde Park and the Produce Stakes were won in his usual wire to wire fashion, setting up a showdown of sorts in the Futurity Stakes at Sheepshead. The race carried a sizable purse of $56,000, which was quite a grand sum in 1893, especially for a two year old race. Domino had to avoid a fallen horse in the race but still carried the speed and won the lucrative event carrying 130 lbs on a heavy track. Dobbins carried the same impost and finished third a half length back. Galilee finished in between the two with fifteen pounds less on his back. Richard Croker, the owner of Dobbins suggested a match race between his star and Domino, which the sporting Keene family accepted. The race was held two days after the Futurity at Sheepshead and ended in a dead heat. The result was somewhat contentious because many felt that Domino was slightly ahead at the wire but it was too close to call for the stewards, and since we are talking about declaring a winner before the advent of finish line cameras, the result stood. Domino was still undefeated however. He made one more start that year a month later in the six furlong Matron Stakes and won easily. Domino’s earnings for the year were $170,790, a record for juvenile earnings that stood for almost forty years when Top Flight passed the mark in 1931. The Black Whirlwind became the new darling of the turf. In an era that had not fully transitioned from the grueling multiple heats of distance racing to declare race winners, Domino had now initiated the appeal to watch fast horses strut their speed. Sprints and two year old races were becoming more popular with race goers, and Domino was at the forefront of this transition. The three year old season of Domino would highlight his lack of stamina, but in races one mile or less in distance he was close to unbeatable, and breathtaking to watch. Domino made his three year old debut in the one mile Withers Stakes at Morris Park. A new challenger appeared in the form of the very good Henry Of Navarre and an old acquaintance in Dobbins showed up for the race. Domino fresh and ready to go won the Withers by a head margin over Henry Of Navarre with Dobbins another three lengths back. The Keenes and trainer William Lakeland decided to try Domino in the one and one half mile American Derby two weeks later at Washington Park in Chicago. The race did not go well as Domino showed that twelve furlongs was beyond his ability and he finished ninth. Henry Of Navarre won the Belmont Stakes, then at one mile and three eighths, and the Travers Stakes to prove he was the best three year old of the year at the classic distances. Domino was given two months off to heal from an injury he sustained in Chicago. Back to Sheepshead and back to sprinting The Black Whirlwind went. He won three straight races at the track in a two week interval, which included a one mile match race against the four year old Clifford. On to Gravesend and two more wins, the six furlong Culver Stakes and at nine furlongs he dead heated with Henry Of Navarre in the Third Special Stakes, which was a match race as they were the only two entrants. The five race winning streak came to an end when he was beaten by Henry Of Navarre and Clifford in the nine furlong Special Stakes ay Morris Park. That was the final race of the year for Domino, a year in which he displayed his speed but also his distance limitations. He would be returning for a third campaign on the track. Domino began 1895 with victory in a six furlong sweepstakes, the forerunner of allowance races, and then finished fourth in the ten furlong Suburban Handicap. Again his limitations betrayed him as he had led for the first mile but reluctantly gave up the lead due to his lack of stamina. He then reeled off wins in a five and one half furlong sweepstakes, the six furlong Coney Island Stakes and the one mile Sheepshead Bay Handicap. The latter win would be his last. A month later, also at Sheepshead Bay, Domino suffered his first and only loss in a race under or at a mile when a horse named Butterflies carried twenty-four less pounds to defeat The Black Whirlwind in the Fall Handicap. The final two races of Domino’s career were at nine furlongs and ten furlongs respectively. He finished second in the first and fifth in the latter. The winner both times was Henry Of Navarre. Domino retired from racing with a record of nineteen wins from twenty-six races and earnings of $193,550. His earnings stood as a record until the day Man O’ War defeated Sir Barton at Kenilworth Park in Windsor in 1920. Domino was now to begin his stud career at the Keene family’s Castleton Stud in Lexington. Here Domino would have a short but extremely influential stallion life. He only lived until 1897 when he suddenly died from spinal meningitis on July 29, 1897 at the age of six. He sired only two foal crops that contained twenty foals in total. One had died not long after birth so in actuality there was nineteen offspring of Domino that made it to racing age. Of those nineteen, fifteen became race winner and seven won stakes races. In the first crop there were two fillies of note. Cap And Bells won the Criterion Stakes at two and then was sent to England for her three year old season. Cap And Bells, bred by James R. Keene, raced under the colours of James Corrigan and won for him the prestigious Oaks at Epsom downs thus giving her sire a major classic winner. The other filly was also bred by Keene, but he retained her for racing, named her Running Stream, and sent her to run in England. Running Stream won the July Cup as a two year old and the Temple Handicap the next year. Running Stream was later bred to a son of Domino named Commando to get the very successful sire Ultimus. Another notable foal from Running Stream was her colt by Ben Brush named Pebbles, the champion juvenile of 1914. Commando is the key link to Domino for future generations of champions. Commando was bred and race by Keene winning seven of nine starts and finished second in his only two losses. Unlike his sire, Commando was able to carry his speed beyond a mile and did so in the then thirteen furlong Belmont Stakes. He was at his best from six furlongs to a mile but the Belmont win served notice that had Domino lived, he would have been serving large books of mares now that his son had won a major race. 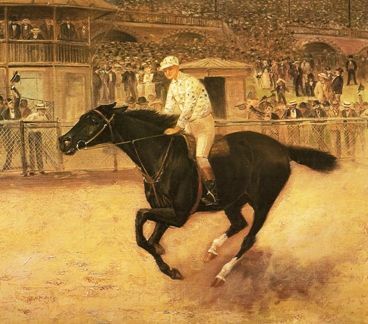 The Belmont was not considered as a classic in 1901, as it is today. Standing at Castleton Stud, Commando lived only one year longer than his sire, and was able to sire only twenty-seven foals in total. He died from tetanus after he cut a hoof on a rock. However two of his sons became champions, one of which was undefeated, while the other was able to carry the male line to further generations of champions. Two other sons went to great success as stallions, thus keeping the major source for speed in American thoroughbred horses at the top of the breeding charts. The first son of Commando to talk about is his great undefeated son Colin. Bred from the broodmare Pastorella sired by Keene’s own stallion Springfield, Colin ran in fifteen races and was never headed at the finish line. Colin won on any kind of dirt surface, sloppy, fast, muddy, and heavy. You name it and he overcame it. He won prestigious races such as the Futurity Stakes, Belmont Stakes, Withers Stakes, Tidal Handicap and the Grand Union Hotel Stakes. In the Belmont he defeated another first class colt in the fiery Fair Play, later to become immortal as the sire of Man O’ War. Attempts to race Colin in England as a four year old were thwarted when he became injured and was subsequently retired to stud without starting a race across the ocean. At stud however Colin was what people in the thoroughbred industry refer to as a shy breeder. He had fertility issues which led to extremely small foal crops. He began his stud career in England but had little patronage, thus Colin returned to the U.S.
Colin sired a total of only eighty-one foals from twenty-three seasons at stud. Unlike his sire and grandsire, he lived a good long life. Colin did get eleven stakes winners from his small output and had influence to such good horses as Stymie and Alsab. Alsab was by Colin’s grandson Good Goods, and from this line comes a sliver of one good sire per generation that leads to the very good sire Ack Ack. From Ack Ack come his good sons Youth (Canadian International, Washington D.C. International, Prix du Jockey Club, Prix Lupin), Broad Brush (Meadowlands Cup), and the good sire Cajun Prince. Peter Pan was the other champion son of Commando to speak of. In keeping with his sire line heritage, Peter Pan became a champion juvenile runner and displayed speed above all else. James R. Keene died in 1913 and his stock was dispersed at auction. Harry Payne Whitney purchased the then nine year old Peter Pan for his breeding farm for the sales topping figure of $38,000. Peter Pan’s son Pennant had won the Futurity Stakes, a race that Keene had made a habit of winning starting with Domino and then his descendants, the year Whitney bought Peter Pan. Pennant, a future Hall of Fame member, sired another Hall of Fame inductee in the great Equipoise, as well as Dauber (Preakness Stakes), Bunting (Futurity Stakes), and a pair of Kentucky Oaks winners in Flying Lee and Mary Jane. Another son of Peter Pan that made good as a sire was the Keene bred Black Toney, out of the Ben Brush mare Belgravia. Black Toney in turn sired Balladier (Champion juvenile), Bimelech (Champion two and three year old, Belmont Futurity, Preakness Stakes, Belmont Stakes etc. ), Black Gold (Kentucky Derby), Broker’s Tip (Kentucky Derby), and the fillies Black Helen (Champion three year old filly, CCA Oaks, American Derby, etc.) and Black Maria (Kentucky Oaks, Metropolitan Handicap, Whitney Handicap etc.). All of these champions were bred and raced by Col. E.R. Bradley, except for Black Maria who was bred and raced by William R. Coe. Black Toney would continue the line to the top level through his son Black Servant, another Bradley bred stakes winner, who in turn sired the exceptional Blue Larkspur. Bimelech also spread the wealth as a sire getting thirty stakes winners from three hundred and sixty-four foals. Fifty stakes winners came from his daughters as broodmares. Balladier sired champion two year old Double Jay, a four times leading broodmare sire. Peter Pan did very well to keep the Domino line going. His daughter Vexatious won the Alabama Stakes and was named as the champion three year old filly of 1919. She in turn produced the 1929 champion handicap horse Diavolo. Peter Pan also sired the full sisters Prudish (Alabama Stakes) and Prudery (Alabama, Spinaway, and Grand Union Hotel Stakes). The latter is the dam of Whiskery (Kentucky Derby) and Victorian (Preakness Stakes). Returning to Commando we find his son Ultimus, an unraced son bred by James R. Keene. Ultimus was a close inbreed to Domino as his sire was a son and his dam, Running Stream, was a daughter of the great Domino. Now if you think this was close inbreeding, how about a son of Ultimus named High Time. Ultimus having been a product of both a son and daughter of Domino was bred to another daughter of Domino, in this case the mare Noonday, and the result was High Time. High Time won only one race, a short sprint, and had a hard time competing at six furlongs and beyond, because he was a bleeder and could not keep up. He did however sire a very good champion in Sarazan, a two times horse of the year and a Hall of Fame member. High Time sired thirty-seven stakes winners which also includes champion two year old High Strung (Futurity Stakes). 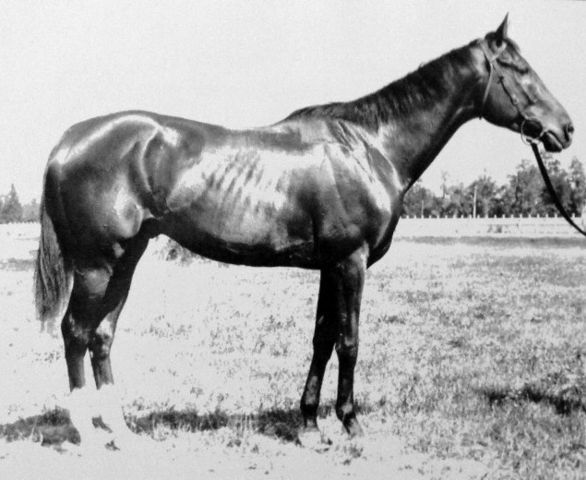 High Time was the leading sire of 1928. Ultimus sired a colt named Stimulus, who won the Pimlico Futurity and two other stakes races as a two year old. He never raced after his juvenile season due to injury. Although Stimulus sired many important stakes winners such as Clang, Danger Point and Beaugay, his claim to fame in breeding lies in his daughter Nandi. A former claimer, Nandi is one of the foundation mares that began the record breaking breeding career of E.P. Taylor. Nandi is the dam of Windfields, the first stakes winner bred by Taylor in his illustrious career. Windfields went on to become a valuable stallion and is prominent in the pedigrees of Victoria Park, Vice Regent, Viceregal, Fanfreluche and many others. One more son of Commando to mention is Brooklyn Handicap winner Celt. Celt was bred and raced by Castleton and stood there after his racing career ended until he was sold at the 1913 dispersal upon James R. Keene’s death. Celt went to Claiborne Farm, then a relatively new outfit that operated in both Virginia and Kentucky. A.B. Hancock sr. was the mastermind behind the operation. Celt became a leading sire and is credited with thirty stakes winners as a stallion. His claim to future importance comes with his daughter Marguerite, who is the dam of Triple Crown winner Gallant Fox, as well as Fighting Fox and Foxbrough. For a short lived stallion Domino had long lasting influence on the breed of the American thoroughbred. While Commando is obviously the key to the line, there would have been no Commando without Domino. It is absolutely remarkable that such influence could be attained from such an abbreviated career as a stallion. Not only was this remarkable, but he was also remarkable in that he was the first of a new type of thoroughbred that would sweep the way in which conformation was perceived to be “fashionable” and ushered in what we now look for in thoroughbred horse appearance. Domino was a shorter than average horse in body length with longer than average legs in his day. Withers higher than the croup were typical back then, thus giving the horse a better frame to race over a distance of ground. The longer bodied horse could also cover more ground with each stride, but this also hampered sheer speed. Shorter bodied, but longer legged horses could generate more speed, providing they had the coordination and heart, and travel at a faster pace. However, as we have seen with Domino, such horses tend to tire quicker because of the rate in which they are pumping their legs to attain such speed. Races were becoming shorter in distance with an emphasis toward early developing two year olds and sprint distances. Going by the way of the Dodo was the longer heats and marathon events that had been the standard for the thoroughbred. Domino excelled at these types of races and had the conformation to pass on to breed such animals. Speed was the key word and Domino provided. Commando continued the type and with the establishment of lucrative two year old races and the emerging Triple Crown in the spring of a thoroughbred’s three year old season, breeders and owners began to covet these events. James Keene bred Domino’s blood to his excellent band of broodmares, of which a majority had come from England. By blending both types, the speed source he had developed crossed very well with the stamina of the English mares and voila, speed and stamina came out in many of the best in the day. I am not saying that Domino’s blood was the only source of speed, far from it because Fair Play, Ben Brush, Friar Rock and the many good speed sources came from Europe at the time as well. Domino however was the prototype. Domino was by all accounts a very easy going and social horse. Although he was nicknamed “The Black Whirlwind”, his colour was often described as being a very dark liver chestnut or brown. His coat took on a different appearance depending on the light conditions. One of the main reasons for his incredible speed was his naturally balanced way of running. He never gave up in any of his races and always competed to his full extent. Domino was a well made and strong horse and was considered a handsome individual. Of course as the saying goes, “any horse looks better after every win”. Domino won nineteen times, so he must have looked like Adonis to those who had an interest in him. Looking back in time to find ground breaking horses in racing is fun. Domino was the epitome of a ground breaking horse. His short but very influential life is in the twenty/twenty vision of hindsight a remarkable life. He was brief but exciting, and he left an entrancing legacy. Domino was a bright flame that burned out far too soon. Wonderful write up. I love the history of race horses. It’s also interesting to see his impact later in the Quarter Horse breed. Thank you Kathleen for the information to the Domino painting. I love these stories about long ago horses.